← 1935: No Needless Noise! 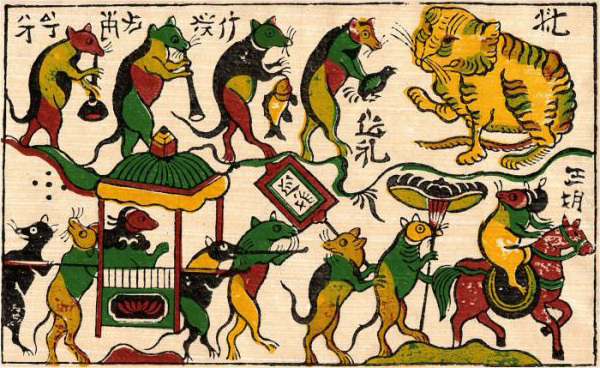 I think this Vietnamese woodcut painting is from the 17th century; it’s one of the most popular examples of Dong Ho painting, and researchers believe that the style originated during the rule of Lê Kính Tông (1600–1619) of the Lê Dynasty (Wikipedia). The paintings are named for Đông Hồ village, where the practice originated, using a special type of paper made from the bark of the dó tree, which is soaked in water for months then mixed with seashell powder and glutinous rice to give it a sparkling sheen. The woodblock is applied with paint and pressed on a sheet of paper like a stamp, once for each color. The finished product is covered with a layer of rice paste. This entry was posted in Uncategorized and tagged 17th Century, Animals, Art, Cats, Mice, Printmaking, Rats, Vietnam. Bookmark the permalink.